Buddhism in Orissa (ancient Kalinga) is as old as the religion itself. Pali texts refer to Buddha's association with Tapasu and Bhallika, two businessmen from Kalianga, who are said to be the first disciples of the Buddha. While Kapilvastu, Bodhgaya and Saranath are places associated with Lord Buddha's life, Orissa was more associated with his teachings. The Chinese Traveller Hieun T’sang records to have seen more than one hundred Buddist monasteries including excellent centers of learning :Pu-si-po-ki-li and Po-lo-mo-lo-ki-li during his visit to Kalinga in 7th century AD. After the bloody Kalinga war in 261 B.C in Orissa (ancient Kalinga), Buddhism was virtually reborn and history took a u-turn as Emperor Ashoka became instrumental in spreading the message of peace across the globe and Buddhism was exported to Sri Lanka, Far-Eastern and South East Asian countries. Buddhism in all its forms and schools like Hinayana, Mahayana, Vajrayana, Kalachakrayana and Sahajayana flourished in Orissa in different periods almost unhindered from 3rd century B.C to 15th century AD. During the reign of Bhaumakara dynasty in Orissa (8th to 10th Century AD), Buddhism reached its zenith. Magnificent monuments-Stupas, Chaityas, Viharas, colossal images of the Buddha and the Buddhist Pantheon and also a few of Emperor Ashoka built over centuries stand witness to the hoary past till today. Discovery of a golden casket containing the bone relics, probably of the Tathagata enhances the sanctity of the ancient land. Though Buddhist sites lay scattered all over the State, Ratnagiri-Lalitgiri-Udayagiri complex has the largest concentration of Buddhist remains in Orissa. 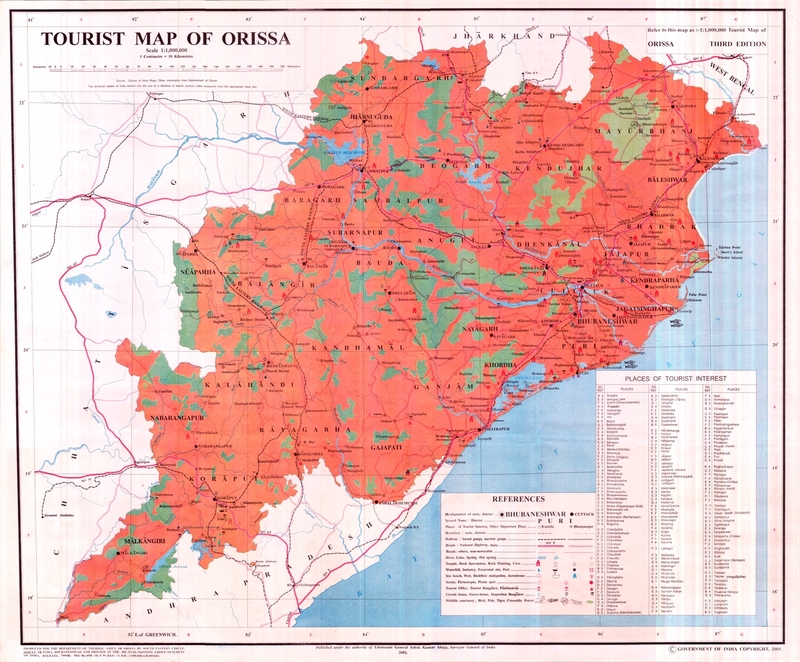 These three places constitute the Buddhist Triangle of the region, popularly known as Diamond Triangle of Orissa. In close proximity lie a few more sites, the most prominent among which is the recently excavated site at Langudi. By Road -Connected by excellent road linking National High Way No.5. from Chandikhol. Tourist can stay at Patharajpur (7kms from Lalitgiri) or Chandikhol (23 km from Udayagiri) or Jajpur (75 kms from Udayagiri) to visit the Buddist sites. Biraja Panthasala, Jajpur, Ph.- 222029 Bisram Lodge, Jajpur. Visitors can also stay at Cuttack and Bhubaneswar. Singing the glory of the past heritage, Lalitgiri is one of the oldest Buddhist Centres of Orissa, dating back to 1st Century AD. Huge brick monasteries, the remains of a chaitya hall, a number of votive stupas and a renovated stone stupa step a small rugged sand stone hill dominate the rural greenery around. The Sculpture shed of the ASI displays a large number of Mahayana sculptures consisting of life-size figures, most of which interestingly contain short inscriptions on them. The standing Buddha figures with knee-length draperies over the shoulders reminds one of the influences of the Gandhara and Mathura schools of art. The Bodhisattva images are some of the most finely sculpted figures produced in India. The discovery of golden caskets in 1985 containing sacred bone relics, probably of the Tathagata himself, from the stone stupa atop the hills further enhances the sacredness of the stupa and the place for the devout Buddhists. It also brings to mind the description of Hiuen T’sang about the magnificent stupa on the top of a hill at Puspagiri Mahavihara which emitted brilliant light because of its sacredness. 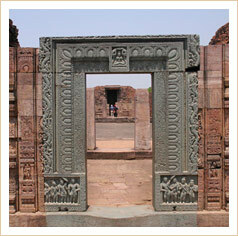 Ratnagiri has a rich concentration of Buddhist antiquities. Extensive excavation has unearthed large monasteries, a big stupa, numerous Buddhist shrines, sculptures and a large number of votive stupas. The excavation revealed the establishment of this Buddhist centre at least from the time of the Gupta king Narasimha Gupta Baladitya (first half of the sixth century AD). Buddhism had developed at this place unhindered up to 12th century AD. Initially this was an important centre of Mahayana form of Buddhism. During 8th-9th century AD, this became a great centre of Tantric Buddhism or Vajrayana art and philosophy. Pag Sam Jon Zang, a Tibetan source, indicates that the institution at Ratnagiri played a significant role in the emergence of Kalachakra tantra during 10th century AD. This is quite evident from numerous votive stupas with relieves of divinities from Vajrayana pantheon, independent images of these divinities and inscribed stone slabs and molded terracotta plaques with dharanis. There is also a smaller monastery at the place along with a stone temple and brick shrines. In the midst of the magnificent monuments, that gives Ratnagiri, a special identity, is the beautifully carved stone Door-Jamb at the entrance of the brick monastery. All the above indicate the importance of Ratnagiri as one of the main Buddhist centres of Orissa from very early times. The Mahavihara at Ratnagiri, as revealed from Orissan inscriptions, was a great centre of learning in Buddhist Philosophy. The new Museum of the ASI houses the scattered images of the area in a decent way for the visitors. Located in the basin of the u-shaped hill, Udayagiri, is one of the largest Buddhist Complexes in Orissa. It has assumed further importance after the recent excavations which revealed the ancient name of the monastery as Madhavapura Mahavihara and brought to light a sprawling complex of Buddhist remains consisting of brick monasteries, a brick stupa, rock-cut sculptures and a stepped well with an inscription. Chronologically, the Udayagiri Buddhist Complex is later than Ratnagiri and Lalitagiri and the monasteries were probably flourishing between 7th and12th centuries AD. The large number of well-built images of Dhyani Buddha, Bodhisattva, Avalokiteswara, Tara, Jambhala, Aparajita, Heruka, etc., a double storied monastery with a shrine chamber and circumambulation path, a water reservoir and such other features make Udayagiri unique in the Buddhist World. Close to Lalitagiri-Ratnagiri-Udayagiri Complex is Langudi, another important site of Buddhism. Recent excavations have unearthed a treasure trove of architecturally and sculpturally rich Buddhist Remains. They include clusters of rock-cut votive stupas, two unique images of the Buddha and Pancha Dhyani Buddha with their female counterparts, brick cells and brick walls. The most remarkable and prize discovery of this place in 2001 are the two inscribed images of Emperor Ashoka, one single and the other with his two queens. The excavation at Tarapur has revealed the identification of 'Kesa Stupa' and the donation of 'Bhikhu Tapusa' for the construction of the stupa at Tarapur. During excavation several plain railing pillars and cross bars have been unearthed. Five of them have inscriptions in early Brahmi characters and proto-Oriya scripts. The largest number of rock cut caves are found here. On top of Deuli hill lies the remains of a huge stupa along with a large number of laterite blocks, bricks and pottery. The staircase leading to the stupa is still visible from the eastern side. A full size stone elephant with an inscription,containg the word ‘Gajaraja’ is the most remarkable identity of Kayama. Situated towards the north of this elephant sculpture, is a rock cut bench with the name 'Tisa' inscribed on it . Tisa was the brother of Emperor Asoka who became a Buddhist and stayed in Kalinga. With the unearthing of this inscription, it is presumed that 'Tisa' had been closely associated with Kalinga. The present excavation here with the discovery of many inscriptions indicate this was the hub of activities in ancient Kalinga. Some scholars opine that that Radhanagar was perhaps the Tosali region of Kalinga. Paradeep, a major sea port of eastern India for trade activities with a fine sea beach and a marine drive is an enjoyable tourist resort attracting large number of visitors from far and wide. The new aquarium is an additional attraction. Otherwise known as Vaitarani Tirtha, Jajpur with Goddess Viraja (Durga) as its presiding deity is one of the sacred places of pilgrimage in Orissa. It is one of the 51 Shakti Peethas of India where the navel of Sati is said to have fallen. The place has its unique importance in India as Navigaya Kshetra where pinda is offered for the satisfaction of the ancestors. The shrine of Sweta Varaha (the white boar incarnation of Vishnu) along with hundreds of other shrines here made Jajpur a Tirtha par excellence. The "Dasasvamedha Ghat", the flight of steps leading to the Vaitarani where the ten horse sacrifice was performed is a great sanctified spot for the Hindus. The annual Ratha Yatra, the chariot festival of Goddess Viraja during Dussehra is an additional attraction. Popularly known as Chhatiabata, Chhatia is a sacred place of pilgrimage. The shrine of Lord Jagannath at Chhatia is a modern piece of Orissan temple architecture. Nearby one can find the archaeological remains of Amaravati-Kataka, one of the five important forts of Chodaganga Deva. Amaravati with the backdrop of the hill "Dhania" presents an attractive sight. Known as "Tulasi Kshetra", Kendrapara is famous for Lord " Baladevajiu Temple". A grand chariot festival is held here annually, which draws a mammoth crowd. Chandikhol in the lap of thickly wooded hills and by the side of a perennial stream is an ideal picnic spot. The Ashram of Baba Bhairavananda is an added attraction of the place. Adjacent to Chandikhol, Mahavinayak enshrines the five god heads in one Lingam. It is a place of worship for Lord Ganapati. Budha Purnima, the full moon day of the month of Baisakha which falls in May-June is observed at Ratnagiri. Check out for Indian and Chinese food in the resturants and hotels at Pathrajpur, Chandikhol and other near by places.